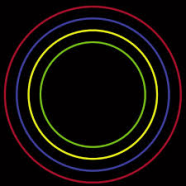 After a four year hiatus and rumours of division, disharmony and imminent collapse, Bloc Party return with one of the year’s most eagerly anticipated releases, the aptly titled Four. There has been much speculation that this record would see the band return to their Art Rock roots, following the disappointingly lukewarm reception for their criminally underrated third album Intimacy. Intimacy attempted to fuse big beats and electronic elements with their trademark indie guitar sound, a move that seemed to estrange fans and critics and cause friction within the band itself. ‘Four’ marks a very definite return to a more guitar orientated sound – while never quite reaching the dizzy heights of their debut ‘Silent Alarm’ there is still enough clever guitar interplay and sonic invention to satisfy existing fans and newcomers to the band alike. Opening with the bludgeoning riff of ‘So He Begins to Lie’ and the manic pop thrill of ‘3 x3’, we are left in no doubt that this is an album with a unified sense of purpose – gone are the forays into experimental electronic terrain that featured so prominently on ‘Intimacy’ and to a lesser extent on second album ‘Weekend in the City’. We are back in familiar Bloc Party territory here – the more sedate call and response dual guitars of first single ‘Octopus’ take things down a notch before album highlight ‘Real Talk’ with its stop start beat and high pitched chorus vocal gives way to ‘Kettling’ and another pulverising riff heavy track. From here on in, the thrills thin out; the second half of the album is a little more patchy with the melodic ‘V.a.l.i.s’ the best on show. Lacking the spiky, Post Punk abandon of ‘Silent Alarm’, the brutally naked honesty of ‘Weekend in the City’ end the experimental edge of ‘Intimacy’, ‘Four’ is a curious beast. By the standards of much of what passes for Indie Guitar Rock these days, it is a resounding success but for a band that produced one of the best debut albums of the noughties, we have come to expect a little more. ‘Four’ is a slow burner that never quite burns brightly enough.